BBC was quick to respond and tweeted the entire conversation. 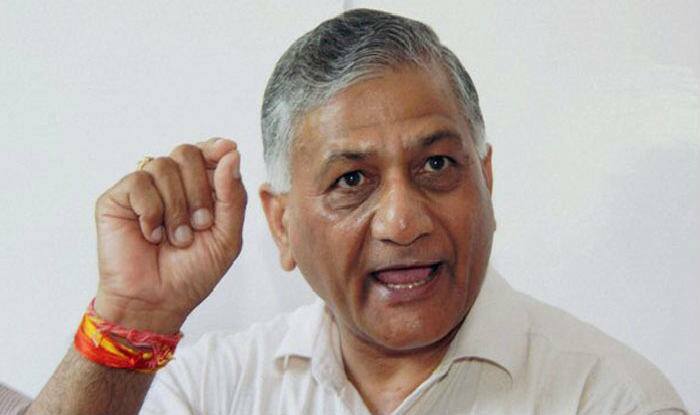 It said, "Gen V K Singh called us 'presstitute'...Please watch the uncut video." New Delhi: This is one controversy that BJP candidate from Ghaziabad and MoS for External Affairs V K Singh could have done without amid Lok Sabha election campaigning. It all began with UP Chief Minister, indulging in some chest-thumping, called the defence forces ‘Modi ji ki Sena’. While Yogi came under the EC scanner for the comment, in a separate interview, Singh said on Thursday that those calling the Indian Army “Modi Sena” were not just wrong but also traitors to the nation. Even though Singh admitted during the interview that he did not know what context the phrase was used, it did spark a debate, since his own party colleague had used it. In his interview with the BBC, Singh said, “Are we talking about the Indian Army or the army of political workers of BJP? I do not know the reference here. If somebody says the Indian Army is the army of Modi, he is not only wrong but a traitor. The Indian Army belongs to India, not to any political party,” Singh said. Meanwhile, the EC has sent a notice to Yogi Adityanath for his statement in Ghaziabad crediting “Modiji ki Sena” for standing up to terrorists with “bullets and bombs”. Yogi’s comment was in violation of the EC directive to all political parties to refrain from invoking the defence forces for their campaigning.